If you are looking for the Shaping Up Blog Hop and Giveaway, click here. It's summer and while my husband is away on a business trip, the kids and are are enjoying Spiderman (my son's new favorite), interesting foods (since the fridge is broken down), and card making. Sophia wanted to take a crack at video card making. Why not I say! She designed this card, edited the photo, and did the video in just a few hours. With some editing help from me, I present her card and video!! I am a proud mama!! Dear Sophia, that was hands down the best crafty video I have ever watched. I learned so much....like, how cool your mom is to let you make cards with good cardstock, buttons, your own tape runner, and pop-up dots. I'm not as nice to my own Sofia. I need to work on that :). You are such a natural, and your card is perfection. Good job Sophia! Your grandparents are proud. The only thing that could have made it better would have been to show your beautiful smile at the end. Fantastic job Sophia! You can be a guest designer (and videographer) for Paper Made Bakery anytime! I'm in love with your card and video, Sophia! I really hope you make some more videos soon! Wow, Sophia! That was a great video! You're a natural at demonstrating card making! Your card is gorgeous as well. I love the brown ink and the stamps you chose. Awesome video, Sophia! No wonder your Mama is proud! I love how your card turned out, and I'm hoping to see more videos in the future! Great video & card, Sophia! I love how you showed all the steps. Looks like you are following in Momma's footsteps! What a great way to get the kids involved! Very talented daughter you have! Great job, Sophia! 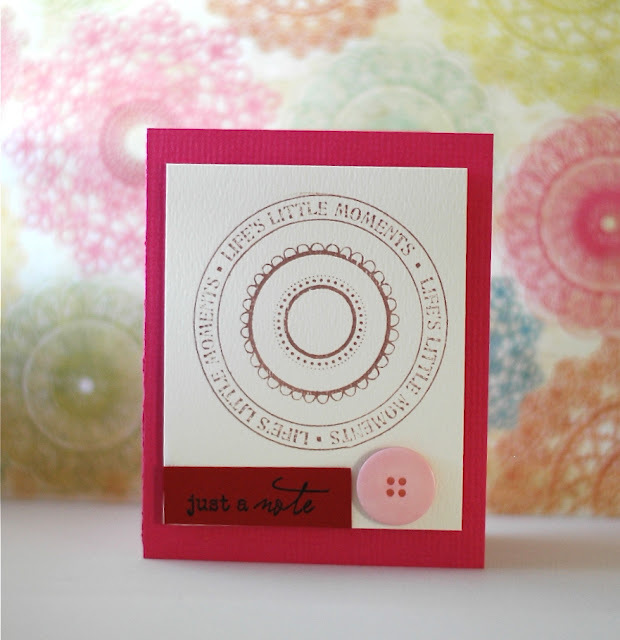 Your colors are spot on, and the photo of your card with the background paper really makes it pop! Sophia! Popping in again to tell you that there's a challenge just for kids at Simon Says Stamp. Check it out! My sweet little Sophia...you make me a proud aunt!! I don't get on fb very much but to come on and see this video made my day. I hope my little Kloe grows up as talented as you :) Keep up the good job. I love you!